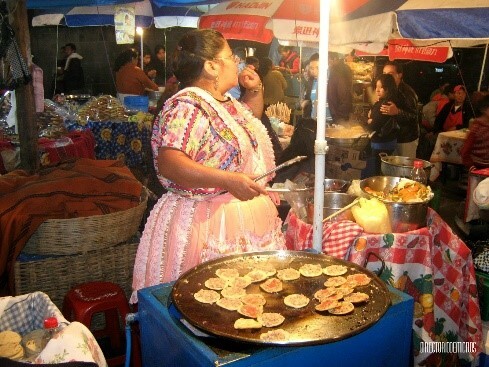 Local food is a huge source of pride for all Guatemalans, not only is it really tasty but can be incredibly cheap. While this list is a good source of tried and tested favorites, we would recommend that you also have a good search for yourself as there are plenty more places with many different traditional dishes. 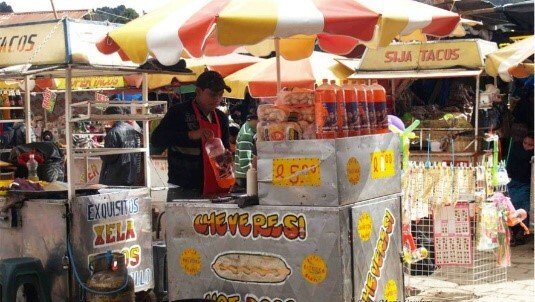 Cheveres – A hot dog served with onions and different sauces (no vegetarian option). The Central Park is the easiest place to find yourself some street food but is probably the most basic of our list. They normally start serving around 6pm and will continue until you’re heading back from your night out. The corner that backs onto the market normally has the biggest variety of options and is also where they hold bigger food markets on special festival days and the first Sunday of the month. 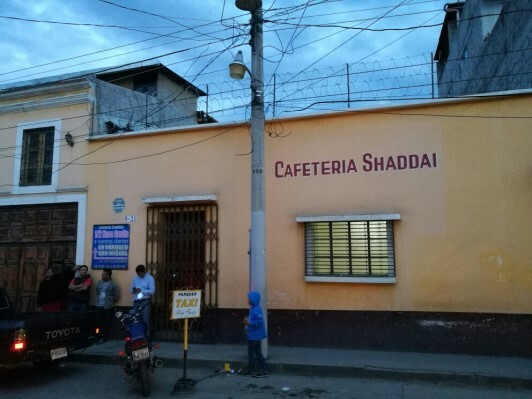 Here you can find tacos (only pork), pupusas, chicken and chips, garnachas for 10Q and sweet hot drinks normally made from corn and rice for 5Q. 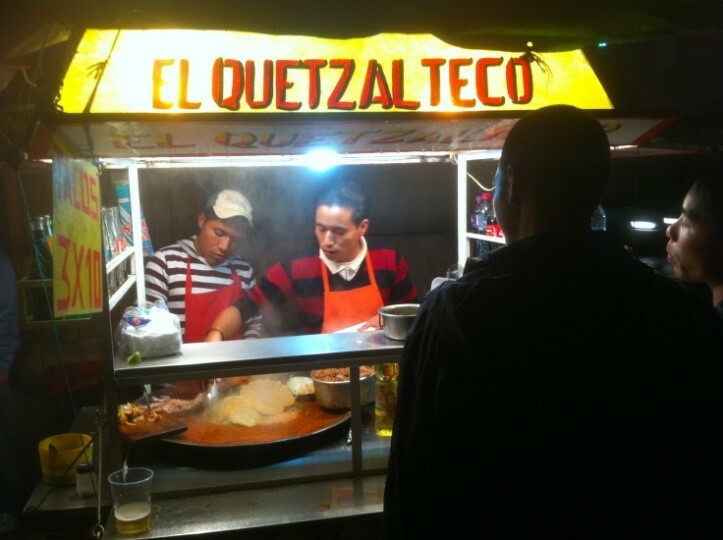 There are also some tiendas to be found in the corner next to the SAT building where they have the same kind of tacos for 10Q, as well as different types of cheveres with differing prices. Our favorite spot in the Central Park is Doña Betty’s churrasco stand that opens up around 9 every night outside BANRURAL. She has been at the Central Park forever and regularly has a good sized queue meaning you sometimes have to wait a bit, but it is definitely worth it for the great selection of meat on offer. This is an extremely basic little family run restaurant has been serving chiles rellenas (10Q) and enchiladas (6Q) for 35 years. Everything is made with minced pork, red onion and teamed up with a great spicy tomato saucy, which is a must try. Don’t let the simplicity put you off, the food here is super fresh as it is prepared just hours before service and the place is so popular that it is normally completely full for the entire two hours it is open, closing when the food runs out. If you’re looking to immerse yourself in everything that is Xela, this is the place for you. Up the road from the Central Park, it’s always packed full of locals owing to the bustling atmosphere. The service is extremely friendly and impressively rapid at the same time, whether you are taking away or eating in! 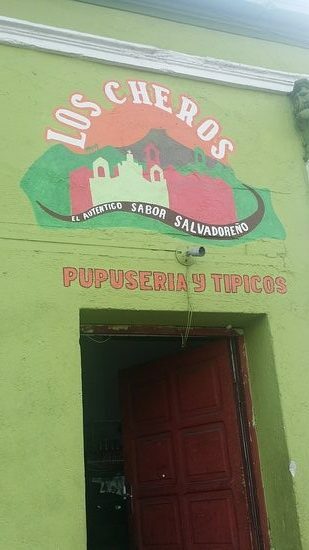 Probably the place in Xela to go for pupusas, these guys have every sort of filling you can dream of, both meat and vegetarian. These are a bit more pricey than the Central Park, setting you back around 20-25Q depending on the filling you want. It’s easy to get lost in all the different options they have here, although our favorite is the simple cheese and garlic. This place is hard to miss, you just need to try and spot the big grill outside, and if you are coming from the centre it should be the first thing you come across. Again, the space is limited relative to the number of customers, so if you see a table grab it quick! There’s so many good churrasco places in this area we decided to give you three all within a stone’s throw of each other, but offering something completely different. These guys have the best marinades and sauces around! Best option is the chicken with chimichurri sauce. A place is 35Q and comes with great roast potatoes and a kind of Sauerkraut. piece of beef, pork, chicken, longaniza and chorizo. If you’re looking for a big feed this is the spot. 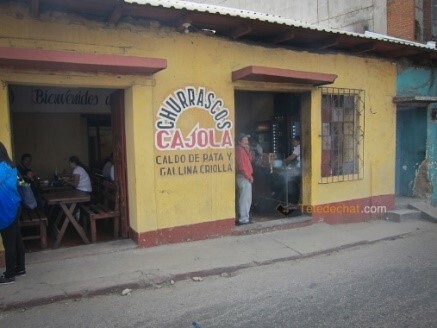 Aside from spending a fortune in a steakhouse this is the best place in Xela for really good quality meat, particularly beef. It comes at a bit of a premium with dishes starting at 35Q, but the sides are great and they also offer great value ‘family deals’ if you’re with a group. Our dessert option in the list takes us up to the theatre and is the perfect place to head after dinner or just for a snack. 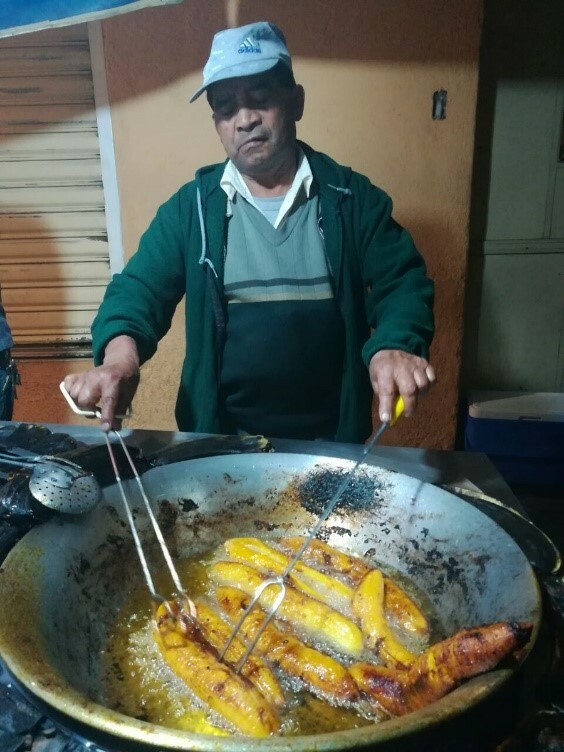 The ‘Platenito’ tienda takes deep fried plantains and sweetens with sugar and cinnamon, before topping with cream for a simple but tasty dessert. It will cost you 7Q and you can enjoy it with a great view of the theatre. These guys normally get started between 8-9pm and you can find them on the corner of the row of shops and bars that face directly opposite from the theatre entrance.